We went back into our archives to pull out an interview with “Labor’s Troubador,” Joe Glazer. The interview is from 2002, and Joe passed away four years later at the age of 88. Joe worked for the Textile Worker’s Union of America, for the United Rubber Workers, and as a labor adviser to the United States Information Agency. 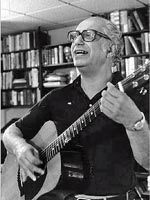 Throughout his life, he recorded over 30 albums of folk music, full of songs about the struggles of the labor movement. Joe shares stories from his life and music with us in this Labor Day special.